I-131 has been in use for many years in the treatment of thyrotoxicosis and differentiated thyroid cancers (DTCs). On the other hand, the aim of most of the clinical studies in I-131-receiving patients was made to show validity of the biological dosimetry methods.,,, There are limited studies in the literature that compare the absorbed dose estimates calculated by both physical and biological methods in patients treated with I-131. In one of them, M'Kacher et al. measured I-131 retention 4 days after the I-131 treatment in thyroid cancer patients and reported that biological dosimetry values were 2–4-fold higher than those of obtained by MIRD method. In the present study, our aim was to reveal relationship in absorbed dose estimations, calculated by physical and biological methods. 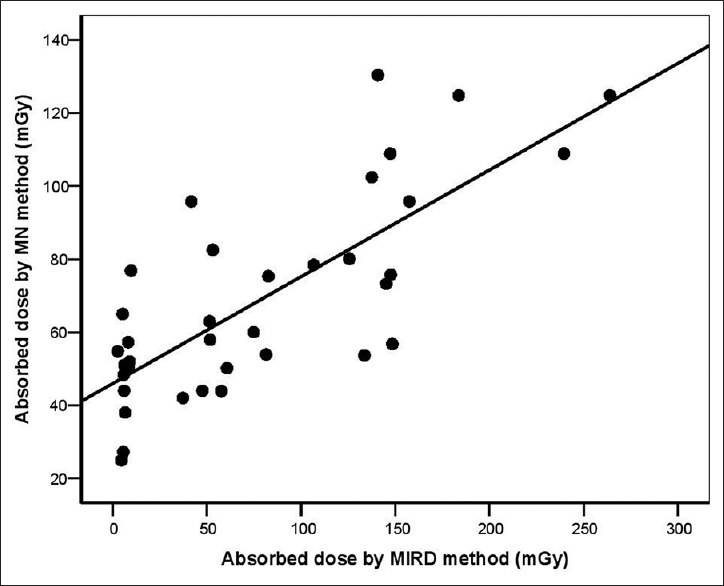 We calculated absorbed dose values through MIRD and MN methods and compared in patients receiving different dose levels of I-131, as very low, low, and high dose. The consecutive 47 patients, receiving various doses of I-131, were included in the study. The patients were divided into three groups according to administered I-131 activity, as follows; Group I (n = 17), patients with hyperthyroidism (all of them with toxic nodular goiter) treated with low dose of I-131 (range; 185–555 MBq); Group II consisted of follow-up patients (n = 15) with DTC who were administered diagnostic dose of I-131 (range; 111–206 MBq) for whole-body scan; and patients in Group III (n = 15) had DTC and were administered ablation therapy with high dose of I-131 while in hypothyroid status, mostly 3.7 GBq (range; 3596–6142 MBq), 4–5 weeks after total thyroidectomy. The patients, previously treated with I-131, were not included in the study, except in Group II. The study protocol was approved by the ethical committee of the institution and written informed consent was provided by all participants. The whole-body absorbed doses from I-131 were calculated both with the MIRD and MN methods in all patients, as detailed in the following sections. A blood sample was obtained from each patient before and 72 h after I-131 treatment for MN method. In addition, MN analysis was repeated 1 month later in some participants (n = 32) to determine the short-term repair status. MIRD method was used for the estimation of whole-body absorbed doses. 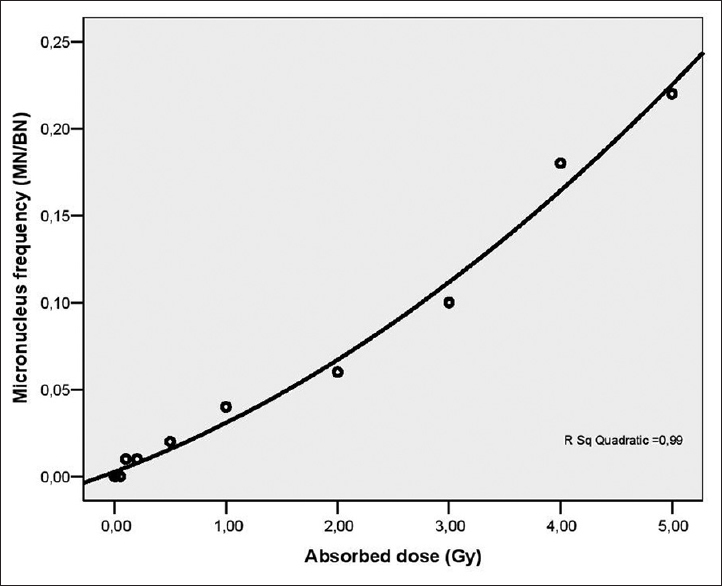 Absorbed doses were calculated using MIRDOSE3 software (MIRD Committee, Radiation Internal Dose Information Center, Oak Ridge Institute of Science and Education, USA). The parameter primarily requested by the program was the residence time of the radioisotope. Residence time refers to the area under the time-activity curve for the organ of interest divided by the activity injected as an intravenous bolus at time zero. In this respect, according to the 2008 EANM Dosimetry Committee procedure, whole-body scan method was used. Several scan trials have been carried out in different rates with the phantom and the calibrator to adjust scan rate in 512 × 512 image matrix using a gamma camera (GCA-7100, Toshiba, Japan) equipped with general purpose parallel-hole high-energy collimator with a single detector. The whole-body scanning was performed at 24, 48, and 168 h after I-131 administration in each patient at 350 mm/min in both the anterior and posterior positions to calculate the residence time [Figure 1]. 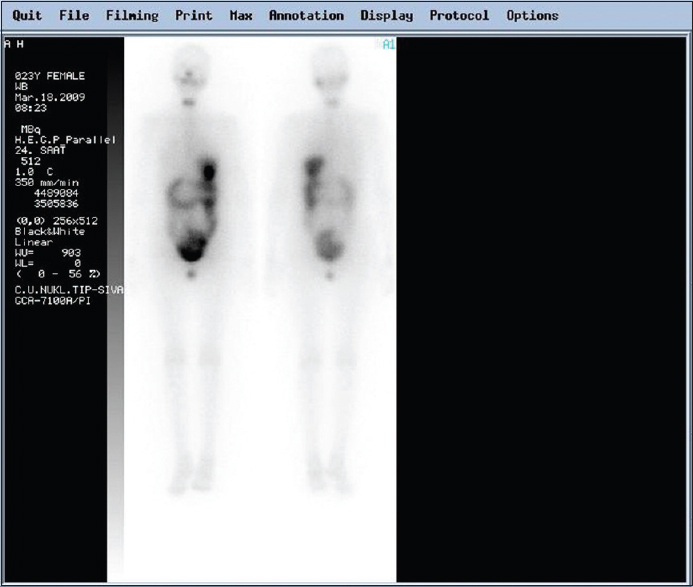 Prior to each scan, another scan was made with standard activity and the patient's dose was calculated by comparing these two scans [Figure 2]. The measured level of whole-body radioactivity at 24, 48, and 168 h was graphed as a function of time. The area under the time-activity curve (cumulative activity) was calculated using statistical software. The residence time was calculated by the following formula: residence time = cumulative activity/administered activity (MBq). Then, the whole-body absorbed dose was obtained by MIRDOSE3 software using the calculated residence time [Figure 3]. CBMN of G0 peripheral blood lymphocytes was carried out using the cytochalasin B technique developed by Fenech and Morley. In brief, heparinized peripheral lymphocyte cell cultures were established for each patient and proliferative cells were blocked through cytochalasin B. Standard RPMI 1640 medium that supplemented 20% FCS was used for cell cultures and 15 slides were prepared for each exam for CBMN analysis. The number of MNs per 500 binucleated cells was scored by a cytogeneticist, using a light microscope (Zeiss Axioskop 2 plus) equipped with a ×100 immersion objective (final magnification: ×1000) and a CCD camera in order to determine the percentage of micronucleated cells [Figure 4]. For the purpose of absorbed dose estimation by biological dosimetry, the in vitro dose-response curve was established by irradiating blood samples collected from healthy volunteers in order to calculate the whole-body absorbed dose through the MN method. Approximately 30 ml of blood obtained from a healthy donor with a syringe containing heparin was divided into 10 separate syringes containing 3 ml each. A special phantom was established with tissue-equivalent material. The blood samples were irradiated using a Varian® CLINAC DHX model linear accelerator at a dose range of 0–5 Gy. Doses were evaluated using a Scanditronix Wellhöfer® DOSE1 model electrometer and FC65-G ion chamber. Blood samples were irradiated using 6 MeV X-ray. X-ray was administered at a dose rate of 300 cGy/min, which is used for radiotherapy treatments. After 1 h, the irradiated samples were stored at 37°C and MN was enumerated. MN frequency was determined by dividing the number of MN from every count by the total binucleate number from the same count. The dose-response curve was obtained with 95% CI using the relating data, which was specific to our institution [Figure 5]. The α and β parameters were determined with the help of nonlinear regression analysis (α =0.020 ± 0.004, β =0.006 ± 0.001). The net MN yield in a patient was obtained by subtracting pretreatment MN frequency from posttreatment MN frequency. Finally, “D = (–α + √[α2 + 4 β Y])/2×β” formula, obtained from Y = α D + β D2 equation, was used for calculation of the whole-body absorbed dose (Y: MN frequency, D: biological dosimetric dose in Gy). Kruskal–Wallis test was used to determine differences in the whole-body absorbed dose between the groups. Wilcoxon test was used to compare pre- and posttreatment MN in all the three groups. Friedman's test was used to determine the difference between pretreatment and 1-month posttreatment MN measurements. For the relationship between variables, nonlinear regression analysis, linear regression analysis, and correlation analysis were used, where appropriate. The data were expressed as mean ± standard deviation. The level of statistical significance was set at P < 0.05. All data were analyzed using SPSS version 13.0 (SPSS Inc., Chicago, USA) for Windows. The present study consisted of 47 patients, 41 females (87%) and 6 males (13%), with a mean age of 47.9 ± 15.8 years (range: 23–83 years). Patients' clinical characteristics, I-131 treatment doses, residence times, and whole-body absorbed doses of I-131 in the cohort study are summarized in [Table 1]. Patients in Group I (hyperthyroidism) were older than patients in Group II (scan) and Group III (ablation) (P < 0.01). The residence time was compatible between Group II (18.4 ± 4.2 h) and Group III (18.3 ± 5.0 h), but significantly longer in Group I (59.3 ± 20.2 h) (P < 0.001). The whole-body absorbed dose estimations, based on the MIRD method, were as follows: Group I: 49.2 ± 20.8 mGy; Group II: 6.5 ± 1.6 mGy; and Group III: 154.3 ± 47.8 mGy; the differences between groups were statistically significant (P < 0.001) [Table 2] and [Figure 6]. The mean number of MN per 1000 binucleated lymphocytes was 1.52 ± 3.28 before and 15.4 ± 11.6 after I-131 therapy in the whole patient group, showing a statistically significant increase (P < 0.001). The difference in MN frequency between pre- and posttreatment was also statistically significant in all groups (P < 0.05) [Table 3]. In Group III, there were significant differences in MN frequencies of pretreatment, 72 h posttreatment, and 1 month posttreatment (P < 0.05). However, cytogenetic damage associated with the observed increase in MN frequency induced by I-131 in all groups was reversible. Biological absorbed doses, deduced from MN frequency, were calculated as follows: 68.2 ± 17.5 mGy in Group I, 46.0 ± 11.4 mGy in Group II, and 90.5 ± 26.9 mGy in Group III [Table 2]. There was statistically significant difference between Group II and Group III (P < 0.01), while the differences between Groups I and II and Groups I and III were not significant. 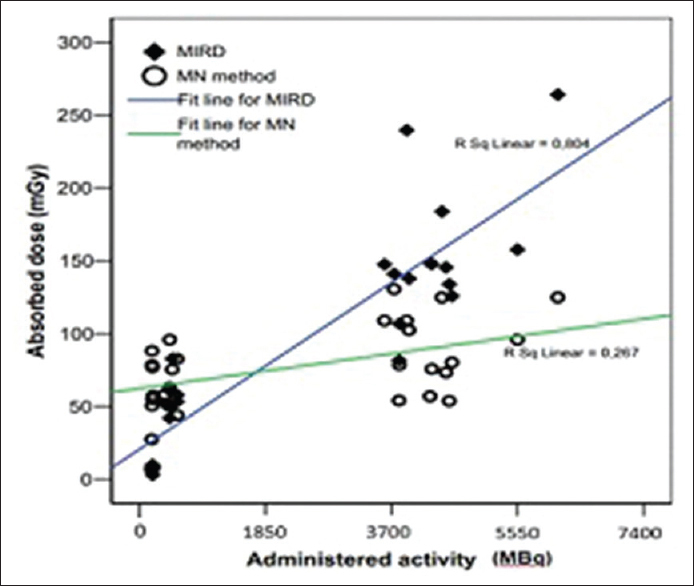 The relationship between the MN and MIRD methods was significant and there was a moderate correlation [Figure 7]. The linear regression equation was; y = 0.28X + 43.6 (r = 0.73 and P < 0.001). However, while absorbed dose calculated by MIRD method was showing very good correlation with the administered I-131 activity (r = 0.89, P < 0.001), it was modest in the MN method (r = 0.52, P < 0.01) [Figure 8]. The mean absorbed dose with MN (74.6 ± 27.9 mGy) was not statistically different from that of MIRD method (68.0 ± 67.1 mGy) in the entire study population (P > 0.08). On the other hand, head-to-head comparisons of absorbed dose values of MIRD and MN methods according to the study groups revealed significant differences in Group II and Group III (P < 0.01) [Table 2]. There are many conflicting reports on the calculation of internal and external absorbed doses of IR.,,,, However, accurate calculation of the absorbed dose is critical for determination of the levels of therapeutic, occupational, and accidental irradiation. The MIRD method is a conventional way to estimate absorbed dose in nuclear medicine practice.,,,,,, Biological MN method is also used to calculate the absorbed dose, especially in research projects.,,,,,,,, In the present study, we compared the MIRD and MN methods in estimating absorbed doses during internal IR in patients who were exposed to I-131 for medical purposes. The whole-body absorbed dose in MIRD method was calculated based on the total body residence time. The residence times in the hyperthyroidism patients (Group I) were significantly higher than that in the thyroid cancer patients, which was similarly reported by Zanzonico et al. They also reported that the effective half-life of I-131 was approximately 1 day in patients with thyroid cancer because there was little or no functional thyroid tissue remaining postthyroidectomy and the secretion of thyroid hormone into circulation was very low. In the present study, the mean effective half-life of I-131 was around 1 day in patients with DTC and 4 days in thyrotoxic patients. An ideal biological dosimetry assay should be sensitive to a wide dose range, rapid and simple, and must measure radiation-specific change. However, in our study, this situation was observed only in higher doses with MIRD method and in low doses the relationship between residence time and absorbed dose was found to be weak. This finding constitutes a question mark in terms of accuracy of MIRD method in low doses. In terms of its energy spectrum, I-131 is located in the low-LET radiation group. Therefore, it may be difficult to follow in vivo biological activity of I-131. However, with increasing dose of I-131, an increase in the number of MN was observed. In our study, MN frequency in ablation patients showed an increase of 217% compared with pretreatment values (compared with baseline). Gutiérrez et al. used the MN method to evaluate cytogenetic damage before and after I-131 therapy in patients with hyperthyroidism and thyroid cancer, reporting that the number of MN increased in a dose-dependent manner in patients treated with I-131. Similar findings were reported by Popova et al., which indicated that MN is a valid assay for the evaluation of genotoxicity. An increase in MN was also reported by Gaiski et al. in children exposed to diagnostic X-ray. Dardano et al. also reported that cytogenetic damage induced by low-dose I-131 (<555 MBq) was minimal and reversible. In this study, the number of MNs was found to be different between the groups, pre- and posttreatment. However, there was a varied situation in calculations of absorbed dose with MN which was based on the calibration curve. Probably in higher doses of I-131, calibration sensitivity is higher. However at lower doses of I-131, calibration sensitivity remains limited. 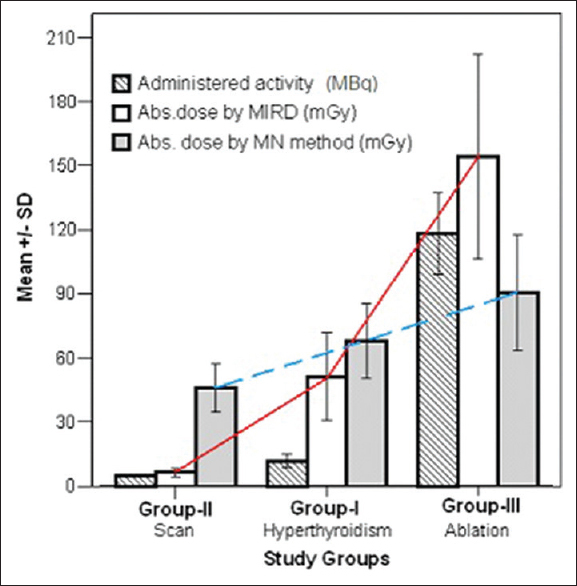 Indeed, difference in mean absorbed dose between patients who were administered 5 MBq I-131 for whole-body scan (Group II) and hyperthyroidism patients who were treated with 12 MBq (Group I) was not statistically significant. In contrast, when calculated absorbed doses by MIRD between these two groups were compared, significant difference was observed as expected. When dose-response (calibration) curve for MN was compared with the curve of Lloyd's study, although there was no complete overlapping of the regression coefficients (already not expected), quadratic structure is compatible with dose-response curve. Already, the calibration curve used in such studies must be specific to that institution. We observed very good correlation between whole-body absorbed dose and administered I-131 activity in MIRD method. In MN method, there was no relationship, especially between absorbed doses and low doses of I-131. A high correlation cannot be expected between absorbed dose and I-131 dose, but still there might be a relationship. Monsieurs et al. also reported that there was no relationship between administered doses and absorbed doses of IR on the basis of MN frequency in hyperthyroidism patients. The same researchers reported that there was no correlation between the level of thyroid activity 7 days posttreatment and MN frequency in thyrotoxicosis patients. We thought that this was still caused by a problem with the MN method. One of them is may be a difference in individual sensitivity arising from known personal factors (smoking, age, etc.). To eliminate this difference, we used pretreatment MN frequency and posttreatment MN frequency (difference in MN frequency). On the one hand, this process may reveal the net effect of IR by taking into account the baseline values of MN, but on the other hand, propagation of error may result. However, we also calculated absorbed dose using only posttreatment MN frequency and the results were similar (data not shown). Therefore, we believe that this variation would have raised from the method. In this instance, we believe that at low doses of I-131, “low LET radiation” factor probably has come to the forefront. In addition, as required by the method, irradiation is performed to lymphocytes within a few seconds in in vitro conditions while acquiring dose-response curve. Hence, here there is a sudden administration of IR. However in fact, during I-131 therapy, patients are continuously exposed to IR for a long time (up to 196 h). In the present study, the mean absorbed dose with MN was not statistically different from that of MIRD method in the entire study population. On the other hand, head-to-head comparisons of absorbed dose values of MIRD and MN methods according to the study groups revealed significant differences in Group II and Group III. On the other hand, M'Kacher et al. performed a biological dosimetry study based on scoring chromosomal aberrations in peripheral lymphocytes in thyroid cancer patients treated with I-131 and reported that biological dosimetry results were 2–4-fold higher than MIRD measurements. However, in their study, they had used the 4th day of total body retention of I-131 by whole-body scanning. We have used at least three time points to obtain body retention of I-131 by whole-body scanning. Significantly decreased MN frequency was detected in ablation therapy group (Group III) 1 month after therapy. In the rest of the other groups, decreased MN frequency was determined, but it was still higher than the basal level and the difference was not statistically significant. The present findings support the theory that the repair process begins earlier in cases exposed to high-dose IR than in those exposed to low-dose IR. Internal dosimetry calculation based on the biological effective dose has an important role in planning radionuclide treatment. In order to reliably estimate the absorbed doses in the treatment of thyroidal diseases with I-131, the following data are required; thyroid gland mass, fractional uptake of I-131, effective half-life, distribution in other organs and tissues, and excreted ratio of I-131 from the body. However, such data are rarely available and the dose calculations are generally based on reference models. Furthermore, Brill et al. reported that alteration of normal retention and excretion pathways can lead to large errors in the estimation of the IR dose in patients exposed to I-131, and that in such instances, baseline models need to be modified. The MIRD method is not a perfect method since it is based on phantom simulation and considered to be not sensitive to individual differences. Stabin, one of the MIRD formulation theorists, reported that the MIRD model is not sufficient for dose measurement and treatment planning in thyroid cancer patients; he recommended that a patient's medical image be used as a base-improved specific model for three-dimensional dose determination., Research has shown that the distribution of radiation varies according to individual, whereas the MIRD method assumes uniform distribution in organs. On the other hand, MN method is not suitable for a radiopharmaceutical dose prediction. MN method, however, can be used to estimate absorbed dose in patients previously exposed to IR. However, our results indicate that this method is more reliable to calculate the absorbed dose at relatively high therapeutic doses rather than low doses as in ablation patients' group. We believe that using MN method in low doses of radiopharmaceutical therapy may cause errors and therefore, it will be useful in higher doses of radiopharmaceutical therapy. The current findings show that the relationship between the MIRD method and MN method is limited. Whole-body absorbed doses, estimated by MN method, showed moderate correlation with administered radioiodine activities in low radioiodine doses and had significantly different and fluctuating values as compared to MIRD method in patients treated with I-131. Thierens H, De Ruyck K, Vral A, de Gelder V, Whitehouse CA, Tawn EJ, et al. Cytogenetic biodosimetry of an accidental exposure of a radiological worker using multiple assays. Radiat Prot Dosimetry 2005;113:408-14. Brenner DJ, Doll R, Goodhead DT, Hall EJ, Land CE, Little JB, et al. Cancer risks attributable to low doses of ionizing radiation: Assessing what we really know. Proc Natl Acad Sci U S A 2003;100:13761-6. Thompson LH. Recognition, signaling, and repair of DNA double-strand breaks produced by ionizing radiation in mammalian cells: The molecular choreography. Mutat Res 2012;751:158-246. Thierens H, Vral A, Morthier R, Aousalah B, De Ridder L. Cytogenetic monitoring of hospital workers occupationally exposed to ionizing radiation using the micronucleus centromere assay. Mutagenesis 2000;15:245-9. Gilbert ES. Ionising radiation and cancer risks: What have we learned from epidemiology? Int J Radiat Biol 2009;85:467-82. Watanabe N, Yokoyama K, Kinuya S, Shuke N, Shimizu M, Futatsuya R, et al. Radiotoxicity after iodine-131 therapy for thyroid cancer using the micronucleus assay. J Nucl Med 1998;39:436-40. Lee TK, O'Brien KF, Naves JL, Christie KI, Arastu HH, Eaves GS, et al. 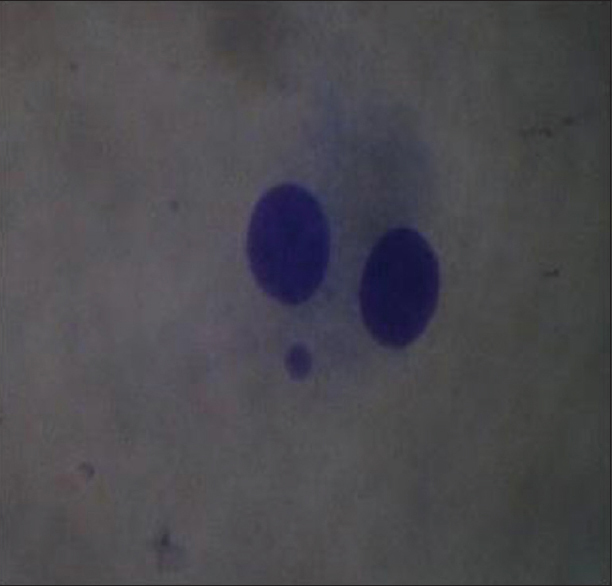 Micronuclei in lymphocytes of prostate cancer patients undergoing radiation therapy. Mutat Res 2000;469:63-70. Stopper H, Hempel K, Reiners C, Vershenya S, Lorenz R, Vukicevic V, et al. Pilot study for comparison of reticulocyte-micronuclei with lymphocyte-micronuclei in human biomonitoring. Toxicol Lett 2005;156:351-60. Sgouros G, Roeske JC, McDevitt MR, Palm S, Allen BJ, Fisher DR, et al. MIRD pamphlet no 22 (abridged): Radiobiology and dosimetry of alpha-particle emitters for targeted radionuclide therapy. J Nucl Med 2010;51:311-28. Lassmann M, Hänscheid H, Chiesa C, Hindorf C, Flux G, Luster M, et al. EANM dosimetry committee series on standard operational procedures for pre-therapeutic dosimetry I: Blood and bone marrow dosimetry in differentiated thyroid cancer therapy. Eur J Nucl Med Mol Imaging 2008;35:1405-12. Lassmann M, Chiesa C, Flux G, Bardiès M; EANM Dosimetry Committee. EANM Dosimetry Committee guidance document: Good practice of clinical dosimetry reporting. 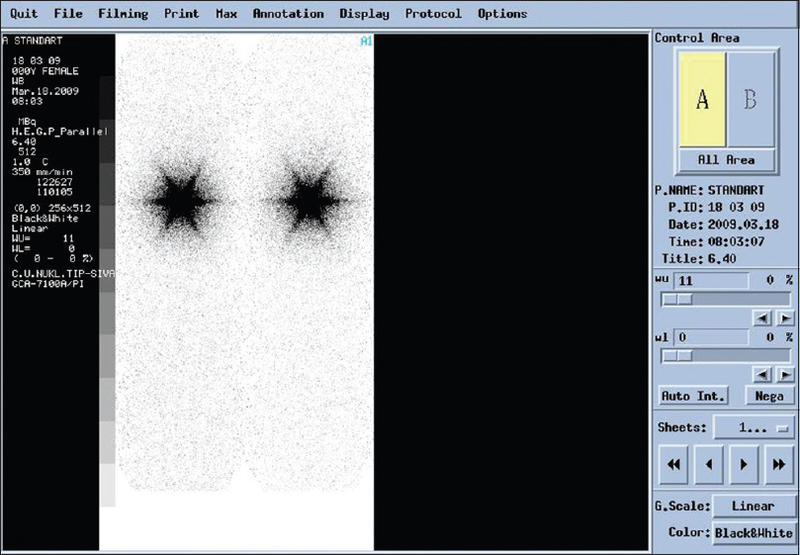 Eur J Nucl Med Mol Imaging 2011;38:192-200. Bolch WE, Eckerman KF, Sgouros G, Thomas SR. MIRD pamphlet no 21: A generalized schema for radiopharmaceutical dosimetry – Standardization of nomenclature. J Nucl Med 2009;50:477-84. Gulec SA, Mesoloras G, Stabin M. Dosimetric techniques in 90Y-microsphere therapy of liver cancer: The MIRD equations for dose calculations. J Nucl Med 2006;47:1209-11. Erselcan T, Sungu S, Ozdemir S, Turgut B, Dogan D, Ozdemir O, et al. Iodine-131 treatment and chromosomal damage:In vivo dose-effect relationship. Eur J Nucl Med Mol Imaging 2004;31:676-84. Serna A, Alcaraz M, Navarro JL, Acevedo C, Vicente V, Canteras M, et al. Biological dosimetry and Bayesian analysis of chromosomal damage in thyroid cancer patients. Radiat Prot Dosimetry 2008;129:372-80. Joseph LJ, Bhartiya US, Raut YS, Kand P, Hawaldar RW, Nair N, et al. Micronuclei frequency in peripheral blood lymphocytes of thyroid cancer patients after radioiodine therapy and its relationship with metastasis. Mutat Res 2009;675:35-40. Heddle JA, Cimino MC, Hayashi M, Romagna F, Shelby MD, Tucker JD, et al. Micronuclei as an index of cytogenetic damage: Past, present, and future. Environ Mol Mutagen 1991;18:277-91. Gutiérrez S, Carbonell E, Galofré P, Creus A, Marcos R. Cytogenetic damage after 131-iodine treatment for hyperthyroidism and thyroid cancer. A study using the micronucleus test. Eur J Nucl Med 1999;26:1589-96. Gajski G, Milković D, Ranogajec-Komor M, Miljanić S, Garaj-Vrhovac V. Application of dosimetry systems and cytogenetic status of the child population exposed to diagnostic X-rays by use of the cytokinesis-block micronucleus cytome assay. J Appl Toxicol 2011;31:608-17. M'Kacher R, Schlumberger M, Légal JD, Violot D, Béron-Gaillard N, Gaussen A, et al. Biologic dosimetry in thyroid cancer patients after repeated treatments with iodine-131. J Nucl Med 1998;39:825-9.
International Atomic Energy Agency. Cytogenetic Analysis for Radiation dose Assessment: A Manual. Technical Report No. 405. Vienna: International Atomic Energy Agency; 2001. Venkatachalam P, Solomon FD, Prabhu BK, Mohankumar MN, Gajendiran N, Jeevanram RK, et al. Estimation of dose in cancer patients treated with fractionated radiotherapy using translocation, dicentrics and micronuclei frequency in peripheral blood lymphocytes. Mutat Res 1999;429:1-2. Brill AB, Stabin M, Bouville A, Ron E. Normal organ radiation dosimetry and associated uncertainties in nuclear medicine, with emphasis on iodine-131. Radiat Res 2006;166:128-40. Zanzonico PB. Radiation dose to patients and relatives incident to 131I therapy. Thyroid 1997;7:199-204. Lloyd DC, Dolphin GW. Radiation-induced chromosome damage in human lymphocytes. Br J Ind Med 1977;34:261-73. Monsieurs MA, Thierens HM, van de Wiele CV, Vral AM, Meirlaen IA, de Winter HA, et al. Estimation of risk based on biological dosimetry for patients treated with radioiodine. Nucl Med Commun 1999;20:911-7.